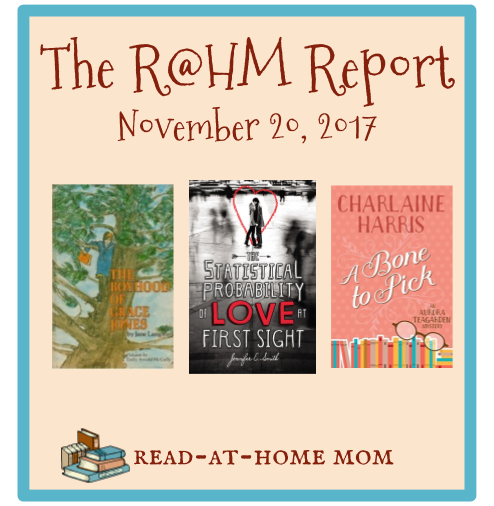 On Friday, I posted the first installment of a new feature: The Read-at-Home Kids Report. Click here to check out what my three girls have been enjoying lately (including The Milly-Molly-Mandy Storybook, Frog & Toad All Year, and Owl Babies). I enjoyed this, despite its flaws. My review is on Goodreads. This isn't really a mystery, but since I love the main character, it didn't matter to me. Reviewed on Goodreads. This was adorable. Definitely Smith's best. This was not as good as We Were Liars. I liked it, but the structure of the story - telling events in reverse chronological order - felt pretty gimmicky. Review is forthcoming on Goodreads. The character of Babymouse doesn't translate too well to prose, nor does she become more endearing as a middle schooler. I gave this 2 stars. My quick review is on Goodreads. I loved this book. Jane Langton is underrated. My review will be here on the blog next Wednesday. I like Telgemeier's earlier books better, but this one was good, too. I posted a review on Goodreads. I picked this up randomly at a used book sale because it is illustrated by Joe Krush. It's not quite the lighthearted teen read I was expecting. Instead, it's a coming of age tale involving all the serious issues girls face in adolescence. I just hope it's not as excruciating as Up a Road Slowly by Irene Hunt. We bought this entire series used over the summer and I've been eyeing them on the bookshelf, I've read a few chapters of this and so far, I like it just as well as Herriot's stories in picture book format. My sister graduated high school with this author and she passed the book onto me years ago when it first came out. I wanted to read a romance, and this was hanging around, so I finally picked it up. I like the writing style so far, and the main character has a great voice. I'm about a quarter of the way through this book and I love it just as much as the first. I also like the fact that the mystery involves high school kids - it satisfies my desire to read YA without me having to look for more appealing YA titles. I am not actually reading this because of the new movie, but because of First Class Murder by Robin Stevens, which is part of my favorite middle grade mystery series. But I definitely want to see the movie eventually. I read some of this book because my Catholic book club was discussing it and I decided at the last minute to go to the meeting. I don't love the writing style, and the discussion sort of covered everything I will probably get out of it, so depending on how much reading time I have I may decide not to finish. My birthday was this weekend, and my mom sent me this book as a gift. I love this series and can't wait to catch up with my favorite characters. Wow! So many good books! I really liked The Statistical Probability of Love at First Sight. Come see my week here. Happy reading! You' be introduced me to lots of new to me authors today. Thanks.